I like to think of myself as a mom on the go. A mom who has a bag like Mary Poppins and I have practically everything I need with me at any time. When we are out and about, I always have to pre-plan about what I may need and how I can handle any situation. One thing that I never leave the house without is my Huggies Clean’n’Clutch Wipes. I’ve been using these since the day they came out. How brilliant is a re-loadable package with a string on it? My bag has to have everything from toys, snacks, quick distractions and of course my diaper changing kit. My daughter loves the Huggies Clean’n’Clutch Wipes packaging and the strap is a welcome distraction for her while I’m changing her diapers. Not only are the Huggies Clean’n’Clutch Wipes good for quick diaper changes, they are also perfect for messy moms (and dads too!) I keep a clutch in my car at all times for when I happen to spill a coffee or make that inevitable mess. I probably shouldn’t admit how often I use a wipe for a mess I made! We also keep them handy as we are in the beginning stages of potty training. Paired with Huggies Pull-Ups, it’s a perfect combination to get my little one interested in the potty! My daughter also can open the packaging and get out a wipe. This gives her the opportunity to feel like a big girl and work on her fine motor skills! You can find Huggies Clutch ‘n’ Clean in the baby wipes aisle at your nearest Babies”R”Us locations. My store had a handful of cute and colorful options including a Mickey Mouse print that was a must on our list! I love that I can find everything at Babies”R”Us as my One Stop Shop for Baby. You can get your own Free Huggies Clutch ‘n’ Clean Wipes with your Huggies purchase of $50 or more at Babies”R”Us. In Store Only! Valid 9/1-9/30. You can find your nearest location here. 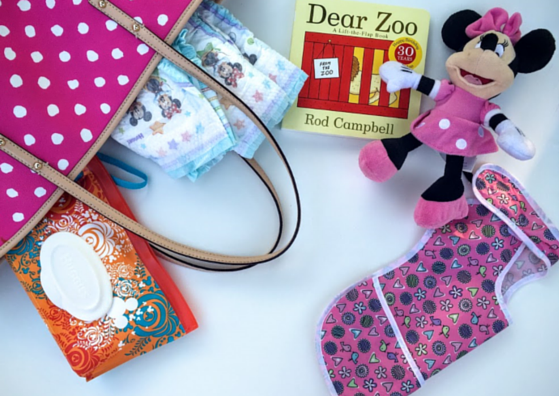 Now that you’ve seen how I use the Huggies Clutch ‘n’ Clean Wipes, where would you use yours on the go?